New from OneVision Software is the Wide Format Automation Suite which incorporates functions such as nesting, tiling and paneling, together with cut line management. 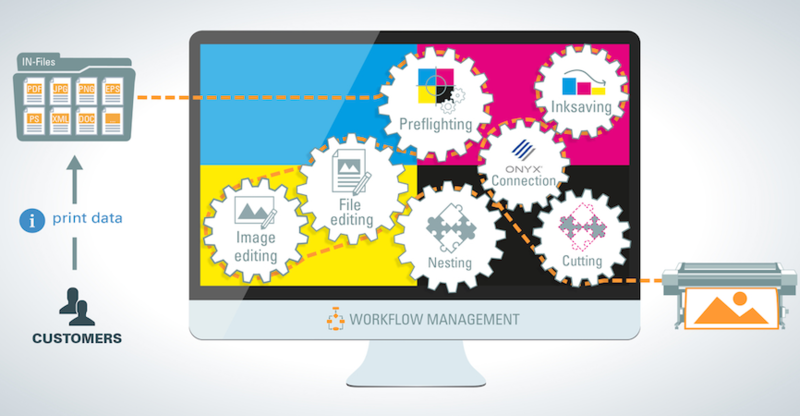 Automation Suite incorporates a flexible workflow management system, a comprehensive prepress package, innovative technologies such as nesting, tiling and paneling, as well as a direct interface between the software and the print press. Workflows and assembly lines can be created digitally with an easy-to-use drag and drop editor – with changes possible at any time. The individual production steps are also automated by introducing major new functionalities to the workflow management system. The first stage of the process involves basic optimisation and colour input calibration. This involves checking the print data quality of the incoming print jobs for possible errors using the ‘Preflight’ module. These errors are subsequently corrected to ensure smooth, error-free printing. Depending on the job type, a variety of complex steps, including the generation of registration marks and barcodes, can also take place at the start of the process. Following data optimisation, transparencies are flattened to speed up the print process and avoid colour errors. Finally, the normalisation module adapts all print data for consistency with the print environment, after which nothing more is required to enable smooth and error-free processing of print PDFs. In order to minimise waste and to reduce surplus as far as possible, the Nesting Module can intelligently arrange print jobs from multiple customers in different shapes on a single sheet or roll. The combined artworks result in a ganged output that optimises the use of the substrate, reducing the amount of waste while saving costs and improving the environmental sustainability of the production process. The integrated Cut Line Manager accepts all cut line types and names and can automatically correct any damaged or incomplete cut lines. Missing bleed, varnish or white masks can easily be created with a fully automated process. Tiling and Paneling enables oversize formats to be divided into multiple, smaller files for easy printing.